So, I've been skating with the Mizfitz in Morgan Hill for about a month now, and I'm really enjoying it. I love that this league is right at the beginning of everything, and if I stick around, I'll be able to be a part of this journey. But SVRG's next bootcamp is looming, and I'm afraid I'll be faced with a major decision - WHICH LEAGUE? On the one hand, all I've ever wanted was to join SVRG. I adore the women in the league, they're officially WFTDA now, they've got everything in place. If I make it through this next bootcamp and tryouts, my dream could come true. On the other hand, SVRG is HUGE and I will be bottom of the totem pole, ability-wise. I will be a small fish in a big pond, and it could be years, potentially, before I actually get to skate in a bout. Realistically, I could be a benchwarmer for quite some time. Or, I wouldn't even get to warm the bench - I'll be a bout volunteer. I am on my way to collecting all 6 Sephora-exclusive colors! I've got one more coming in the mail, and then I'll blog them all properly. Sorry, I was trying so hard to be stealthy that I didn't get it quite right. But you can see all the pertinent information - UDPP in Sin on top, Freelove eyeshadow on the lid, and Haight eyeshadow on the lower lid. It pays to be a Junkie! 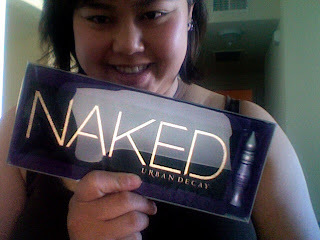 I happened to stop by the Urban Decay counter today (okay, it's never happenstance when I visit a UD counter! ), and the associate who started talking to me (and doing my eyebrows, haha) was the Regional Director of Sales!!! So we were totally chatting it up about the new fall products and the Sephora exclusive eyeshadows and everything she mentioned, I was like, "Yeah, I've tried that!" or "I have that!" or "I ordered that the minute I got the email!" and she was so impressed, she said, "Omigod" (yes, she said "omigod" - not "oh my god," but "omigod") "you should totally work for us!!!!" And I was squeeing like, "I KNOW, RIGHT?" And I asked her about the Lip Junkie glosses that have yet to be released anywhere (though Sephora has been majorly teasing me!!!!!) and she said, "I think we have the testers here in a drawer somewhere, would you like to see them?" OH WOULD I! My parents babysit Jolie while I'm at derby, and usually Jolie plays on the bed next to them while they watch tv. Tonight was the same as normal... well, sort of. While my mom intently had her eyes on the screen, Jolie was sitting right next to her, when all of a sudden OUT OF NOWHERE she emits a burst of loud SHRIEKING while flailing her arms around in the air! Well, my mom was so startled, she practically fell off the bed. Upon seeing this, Jolie BURSTS OUT LAUGHING. Apparently she was trying to scare her grandma half to death, and it worked. She was so pleased with her accomplishment that she proceeded to keep shrieking at random intervals for the next couple of hours, to try to scare both her grandparents. And while they definitely weren't fooled, they did practically split their sides laughing at her antics. Yup, this is my daughter, alright! This look was inspired by my outfit today, which is a pale pink tank top with a long flowy gray skirt. My status has been renewed through the end of 2011! You know what THAT means? Yeah, I caved and ordered the DVDs. That infomercial has been haunting me since I first saw it months ago, and I finally decided that I wanted to try it. So Day 1 is the Fit Test, to see how fit you are. And I'm not. The moves are all plyometric, explosive power moves like jumping (LOTS of jumping), pushups, leg lifts, etc. There are 8 moves total, and you have to see how many you can do in one minute, maximum effort. I'm sweating like a pig just over halfway through, and even now as I'm typing this, there is sweat just DRIPPING down my neck and onto my chest. For what is in essence EIGHT MINUTES worth of working out! Decided to come up with a look using the Naked palette. I managed to keep it to two colors :) I was definitely tempted to use half of them in one look. 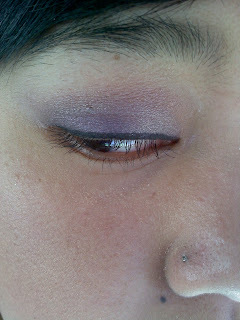 The result is a striking, shimmery-metallic eye look that totally made my eyes pop, but didn't overpower my face. It brought attention to my eyes rather than to my eye makeup. 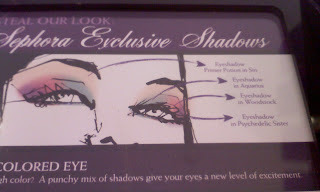 The shades themselves are tame enough for every day, but because they're shimmery, you don't look boring. Hustle (a palette exclusive) is plummy-brown. 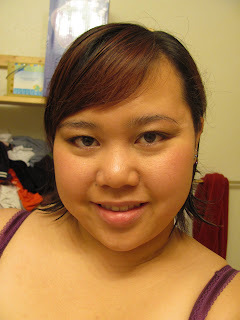 Whiskey (also exclusive) is a matte brown eyeliner, and is perfect next to the brighter shimmer of Toasted on my eyelid. 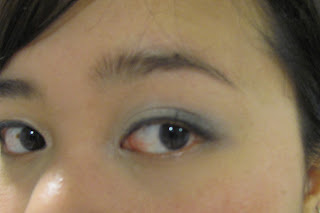 I usually don't do darker shadows in the crease, but I actually really liked this look. 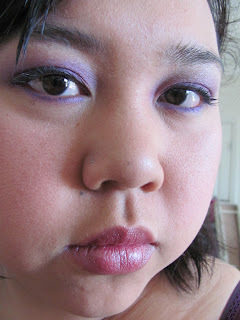 There is a great review (and better photos) at Temptalia, but I just wanted to add my own... I'm just so totally excited to have this. This might end up being my favorite UD palette, even more than BOS II. I can't wait to try this Whiskey eyeliner. 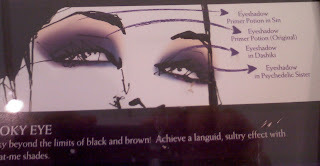 It is precisely the brown I have been wanting from UD since I discovered their eyeliners! I am so in love with derby right now. I'm so happy to be on a team, even though we're a long way from bouting. I'm happy to be a part of the Mizfitz and help the team grow. I got my first taste of jamming tonight (not a real scrimmage, just a drill, so they weren't going all-out on the blocking), and I think I liked it! I've never aspired to be a jammer, because I'm slow and hulky and am much better at being in someone's way. I'm not fast and agile. UD released 6 Sephora-exclusive eyeshadow colors, and they are gooooo-geous. I decided to buy four of them, and try out the looks they put together. Very cute and candy pop. I'm not a good enough photographer to really get the colors to show you - it's much more colorful and less washed-out than in the photos. Aquarius is a GORGEOUS silvery green, unlike any UD shadow I've seen so far, and Psychedelic Sister is the purple that dreams are made of. I love them! You can see why I chose to buy these. Okay, okay. For all my snarking about Twilight, you probably wonder how it is that I am even a fan in the first place. If all I'm going to do is make fun and criticize, why do I even bother? The truth is, I am definitely a fan. I was obsessed with the books at the beginning too. I had a major crush on Edward in book 1, until he broke my heart in book 2 and then I had a major crush on Jacob for being such a sweet and caring guy. I definitely had an opinion on which Team, and I collected merchandise and photos from magazine spreads from the movie. I don't know how you feel about me, but I'm not mad at you, and I don't hate you. I never was, and never did. I stopped talking to you a while ago just because I didn't want to embarrass you in front of your friends. And now I'm not talking to you just because I'm afraid you won't want to talk to me. But I want you to know that if you ever want to talk to me, I wouldn't turn my back on you. Sometimes I see how unhappy you are, and I wish I could be there for you, but again, I'm afraid you won't want me anywhere near you, so I say nothing. But I want you to know that I still care about you, and I hope that this silence isn't forever. I know we'll never be best friends, but... it would be nice to be on speaking terms again. Done in Mirasol Sulka (oh so soft!) on size 10 and 11 needles. 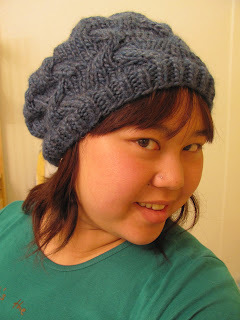 A very quick knit (waaay less than 24 hours), and totally a stash buster. I think I may make this one again, because I love the way the FO looks, and I have TONS of yarn that will work for this project (either bulky, or worsted that I can double), and I don't have to knit for ages and I love mild cabling. Yeah, this is my new favorite hat. That said... Eclipse felt fast to me, and I realized it was because we were totally being spared the extra two hundred pages of Bella's self-pity, whining, and constant exultations of Edward's beauty and perfection. THANK YOU GOD. No wonder the book felt so long! The movie has Bella's voiceover from time to time, but it's far from a total narration, and therefore, we don't have to get to hear every single thing she's thinking.